You want to start a new life here in Bali and run a B&B and stay in the property? Then this will be a chance to realize your new start. This guesthouse is offering space to 6 bedrooms and the office space can be changed in a small studio for yourself. Spacious family home for sale in Sanur’s beach side. This is a large 3 bedroom villa with a colonial touch. A fantastic place on a short walking distance from the shops, restaurants and of course the beaches. Beautiful comfortable Sanur villa for sale in the Mertasari area. A villa which is located just about 5 minutes walking from the beach. 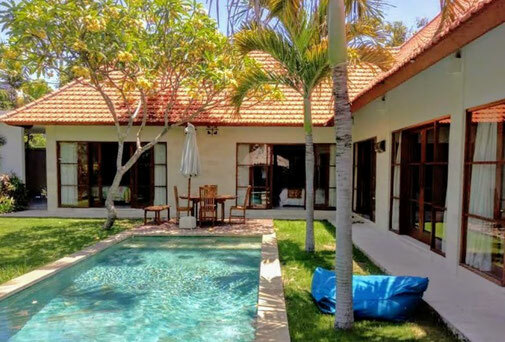 This magnificent 3 bedroom, 2 storey villa is situated just a few steps away from the white sandy beaches, and crystal clear waters of Sanur. Nice comfortable rooms and a very friendly staff, this is what you can offer your future guests. This boutique hotel in Sanur is a pleasant stay. Attractive townhouse located in a one gate small complex. A townhouse with a shared garden, parking and large swimming pool. A cozy home with totally 3 bedrooms, located on a short stroll from the beach. Cozy home for sale in Sanur. This is a nice residential house or it can be a perfect holiday home. A house which is located in a strategic good location nearby a large supermarket and plenty small restaurants. If you are looking for space and a multi-purpose villa, then we can offer you this villa in Kesiman, North Sanur. A villa with 3 bedrooms, a gym, office and even a soundproof music studio. A solid villa just about 500 meters away from the beach. Large family home for sale in a quiet street in Sanur. Located on the opposite side of the By Pass, this villa offers all the space what you are looking for. 4 Bedrooms are available. 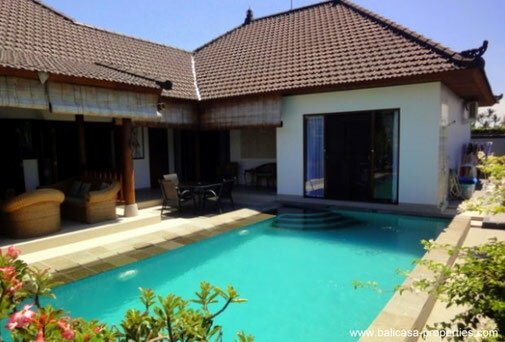 Large 3 bedroom villa for sale in the Jalan Tondano area in Sanur. A perfect home for a family. Offering 3 bedrooms, large open garden and an extra large gazebo next to the long swimming pool. Are you having a family with kids? Then this will be a nice home for you. Located in the heart of Sanur and not to far situated from international schools. And of course, don’t forget the beach. 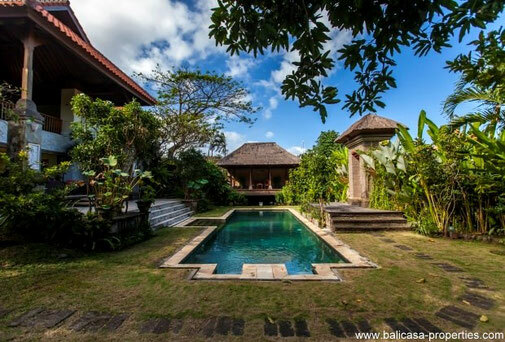 Just about 10 minutes driving from Sanur and you will find this nice villa. Located on a 5 minute walk from the nearest beach. This villa is having 2 bedrooms. It will be easy to create a third bedroom. This cozy home is having an IMB kantor dan rumah tinggal, meaning, you can use this property as your office but it is also allowed to live here permanent. This property is located in the Kesari area, an area nearby the beaches in Sanur. 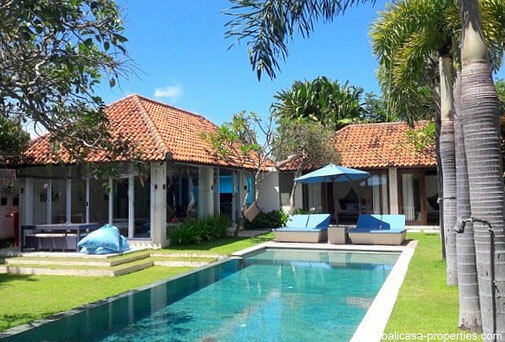 This newly renovated villa is located just a few steps away from the nearest beaches in the Northern part of Sanur. A nice cozy villa with a total of 3 bedrooms. A place just outside the center, still nearby all facilities Sanur has to offer. Is the South of Bali getting to full for you, but still you prefer to live not to far away from some shopping centers or restaurants, then this villa offers you the right solution. A solid home located near Saba and surrounded by rice paddies. access to the beach. A recently renovated villa, located in a small private complex. Simplicity but efficient, these are the keywords for this new Sanur 2 bedroom villa for sale. A brand new villa located in a quiet part of Sanur. Your chance to start your Bali life here. 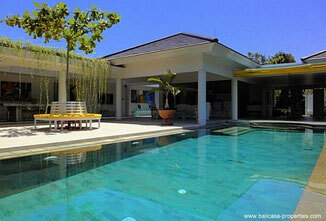 This modern private paradise can be found on the right side of the By Pass in Sanur. In about 10 minutes you can walk from the villa to the main street in Sanur. Beaches are just a short walk away from the villa. 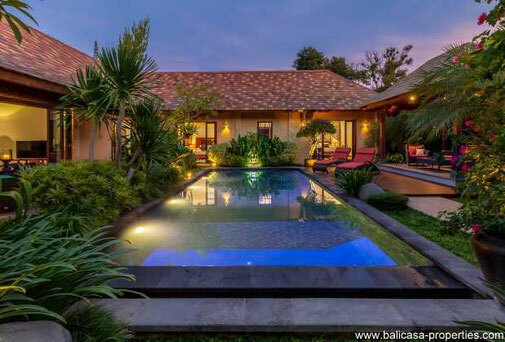 This elegant villa in Sanur is offering a guaranteed and already paid long term lease period, ending in 2060. In this way you can enjoy a long time stay in this top villa. A villa near the Jalan Poso. Location, location, location, that is what sometimes is the most important. Well, this modern comfortable Sanur apartment for sale is having a top location. An apartment situated in an hotel complex.